In an effort to combat human error in the medical field, medical professionals continue to seek the best practices and technology applications for the diagnosis, treatment, and overall care of their patients. 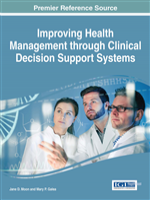 Improving Health Management through Clinical Decision Support Systems brings together a series of chapters focused on the technology, funding, and future plans for improved organization and decision-making through medical informatics. Featuring timely, research-based chapters on topics including, but not limited to, data management, information security, and the benefits of technology-based medicine, this publication is an essential reference source for clinicians, scientists, health economists, policymakers, academicians, researchers, advanced level students, and government officials interested in health information technology. This insightful book includes topics like Bioinformatics, Clinical Research, Electronic Health Records, Future Healthcare, Health Information Technology, Information Security, Nursing Informatics as well as Technology-Based Medicine.